I came home rather late yesterday and just wanted something different as a quick snack before bed time, this idea turned out amazing and when I´m back on some carbs again I´ll try adding a few slices of a tart apple variety! If You want to turn this recipe into a dessert instead of a snack, just make smaller portions add some whipped heavy cream to the dish! Just whip up the eggs in a bowl and add heavy cream to satisfaction. Melt some butter in a pan on high heat and pour the egg/cream mixture in when the melted butter stops bubbling. Use a spatula to fold the edges of the omelett and let the eggs flow out to cover the “naked” spots of the pan to make the dish set faster. 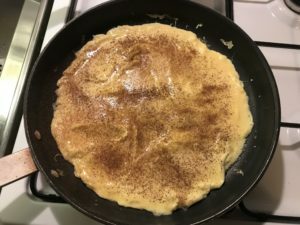 When almost done, sprinkle cinnamon evenly over the surface and gently fold the omelett twice or thrice to create a roll. 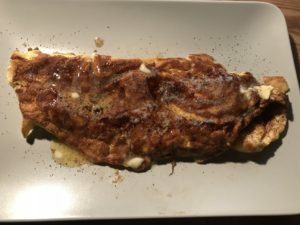 After moving the rolled omelett to a plate, sprinkle some more cinnamon on top and let a few slices of butter melt over the dish!